Call them gutter caps, guards, or covers, if you want to spend less time cleaning gutters, then you definitely need something to keep unwanted debris out of your rain gutters. There are many products out there with some way to accomplish this with varying levels of success. Why should you choose Gutter Helmet® over the many other gutter protection devices? With over 35 years in business, Gutter Helmet is the country’s first, best and #1 choice in gutter protection. 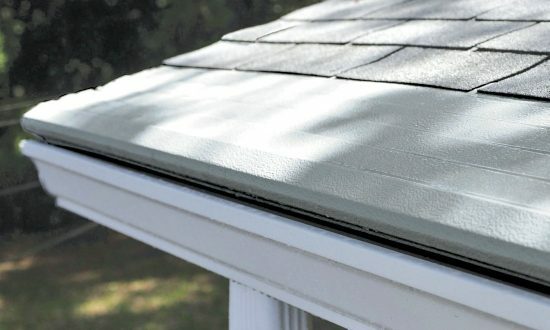 When you choose our gutter guards, you will enjoy several features and benefits unique to this system. When you register your new Gutter Helmet system, you get a transferable lifetime materials and product performance warranty. You’ll never have to worry about replacing your gutter guards again. This unique feature lets rainwater into your gutters while keeping everything else out. Your gutters stay debris- and clog-free, guaranteed. No more climbing ladders or hiring contractors to clean your gutters. Gutter Helmet is made of durable but lightweight aluminum. Sturdy construction increases its tensile strength and a ribbed surface promotes surface tension, allowing Gutter Helmet to withstand the heaviest rainfall, snow loads and extreme winds. Gutter Helmet’s patented PermaLife finish is a high-performance paint that resists fading, chalking and corrosion from salt water and acid rain. PermaLife is available in a wide range of colors to blend with your home. Gutter Helmet is attached to your roof with reinforced aluminum alloy brackets, so your gutter protection system will stay in place even through the worst weather. Use our Dealer Locator to find a factory-trained and certified dealer near you and experience the Gutter Helmet difference for yourself. You can also call Gutter Helmet at (800) 824-3772 or fill out our contact form to request a visit from a sales representative.